The astounding number of veterans and everyday citizens affected with PTSD (Post Traumatic Stress Disorder) tops out at over a million and is continuing to escalate (Dr. Frank Lawlis, PTSD Breakthrough, 2010). You may not have PTSD, but if you are living with a veteran who does, you are suffering from it as well. Now here is a comprehensive practical book solely dedicated to addressing the cries and needs of the loved ones. Finally A book that is geared toward your needs and issues your cries. Love Our Vets answers over 60 heartfelt questions, providing down to earth wisdom and much needed tips for taking care of yourself. Sharing as a counselor and from her personal experience of living with a 100% disabled veteran with PTSD, Welby O'Brien gives hope, encouragement, and practical help for families and loved ones who are caught in the wake of the trauma. This book addresses a broad spectrum of issues and concerns, and offers realistic wisdom from a wide variety of individuals who share from real hearts and lives. 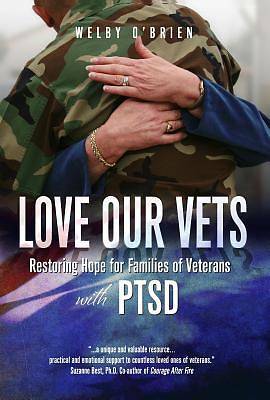 Welcomed by the VA and other counselors, this is not a book about PTSD rather it is a tremendous resource for families and loved ones who struggle along with their vets in the challenges it presents. Welby O Brien has a Masters Degree in Counseling with a background in education. She is the author of Formerly A Wife (WingSpread) and Good-bye for Now (WingSpread). She is also a contributing author for Shepherding Women in Pain (Moody Press) and Chicken Soup for the Soul (Divorce and Recovery). She has been welcomed as a guest speaker across the country, and on radio and television. Her most important qualification is that she is married to a 100% disabled veteran with PTSD. Welby initiated and continues to lead the vet wives support network known as Love Our Vets. She lives what she writes.